On January 6, 2015 La Respuesta magazine and National Boricua Human Rights Network (NBHRN) call on you to act on behalf of the Puerto Rican people’s longest-held political prisoner, Oscar López Rivera. The worldwide campaign calls for 100,000 messages to the twitter accounts of the President, White House, and Justice Department on January 6, 2015, Oscar’s birthday and the Day of the Epiphany/ Three Kings, the holiest day in his Puerto Rico homeland. 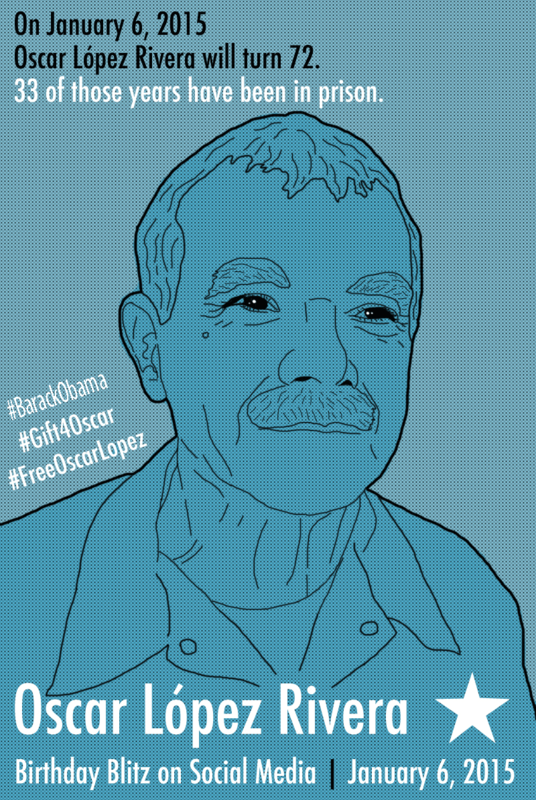 This January 6, 2015, on Twitter, Facebook, Tumblr, Instagram, or any other platform you use, post using the hashtags #FreeOscarLopez, #Gift4Oscar and #BarackObama. On Twitter, make sure to tag @BarackObama so that the man with the power to release him hears our demands. Oscar, who was born on Three King’s Day, has become the Puerto Rican nation’s shining star, able to unite a people facing the divisive effects of a more than one-hundred year colonial occupation. Now, more than ever, the Puerto Rican people have come together in a way that presents U.S. President Barack Obama every reason to exercise his power of pardon and release Oscar. Let’s use social media for social change and send the clear message: RELEASE OSCAR NOW, 33 YEARS IS TOO MUCH!